QINGDAO, China, June 10 (Xinhua) -- With the Shanghai Cooperation Organization (SCO) rounding off a fruitful summit in this eastern Chinese coastal hub, the cross-continental institution is embarking on a new journey toward common security and shared prosperity. The Qingdao meeting marked a milestone in the SCO's history. It was the organization's first summit after India and Pakistan joined China, Kazakhstan, Kyrgyzstan, Russia, Tajikistan and Uzbekistan as full members last year. And in an interesting coincidence, the SCO set sail for a new era in the sailing capital of its birth country. Thanks to the membership expansion, the SCO has grown into the largest regional organization for comprehensive cooperation in the world, in terms of both the area it covers and the population it represents. With 3.1 billion people, it now carries a bigger heft and plays a more important role on the world stage. SCO leaders, as the summit demonstrated, have the will to take on their responsibilities, both to their countries and to the world at large. They pledged to deepen their partnership for peace, cooperation, equality, openness, inclusiveness and mutual benefit, and work with the United Nations and other international and regional organizations to jointly promote lasting peace and common prosperity of the world. They signed a series of agreements and other documents, including the landmark Qingdao Declaration and a five-year action plan for implementing the Treaty on Long-Term Good-Neighborliness, Friendship and Cooperation of the SCO Member States, which have laid out a road map for future SCO cooperation and development. The achievement with perhaps the most far-reaching significance is that the SCO members have further enhanced political mutual trust and reached new consensus on the direction and guidelines of the SCO's future development. Over the 17 years since its foundation, the SCO has unwaveringly adhered to its bedrock principle -- the Shanghai Spirit, which features mutual trust, mutual benefit, equality, consultation, respect for cultural diversity and pursuit of common development. Guided by the Shanghai Spirit, SCO members have carried out productive cooperation in various areas, including security, economy and people-to-people exchanges. That has provided a robust impetus for the development of both the SCO and its members, and turned the institution into one of the most dynamic multilateral mechanisms in the world. For example, the combined GDP of the SCO's six founding members stood at 1.67 trillion U.S. dollars in 2001, and climbed to 12.63 trillion dollars in 2017, recording a more than seven-fold growth. According to SCO Secretary General Rashid Alimov, SCO countries' GDP grew by an average of 4.84 percent in 2016, almost twice as fast as the global GDP. In view of the profound changes in today's world, the Shanghai Spirit has been accordingly enriched. 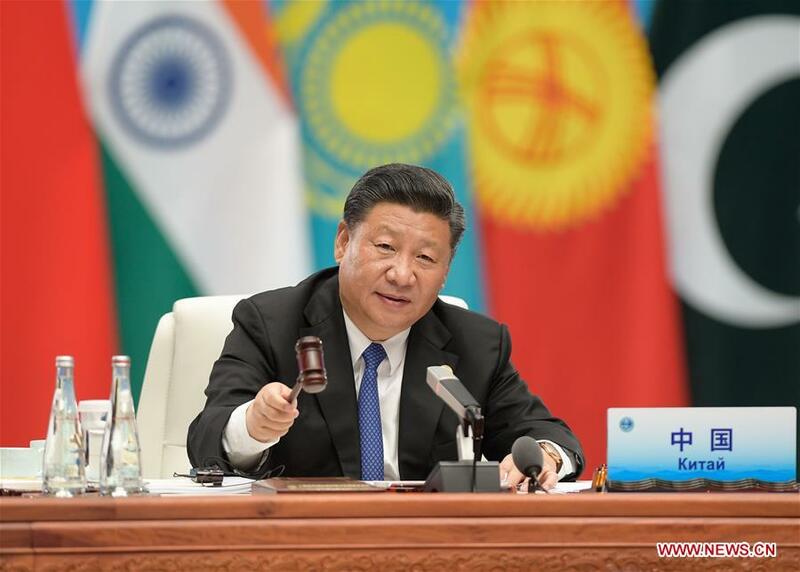 At the Qingdao summit, Chinese President Xi Jinping offered China's insights on security, development, cooperation, civilization and global governance, which have given a fuller shape to the Shanghai Spirit in the new era of SCO development. It is mainly because of the continuous upgrading of the SCO's guidelines that the organization has enjoyed impressive growth and become a model for building the China-championed new type of international relations, which features mutual respect, fairness and justice, and win-win cooperation. Now with the conclusion of the historic Qingdao summit, the SCO will certainly make new strides toward an even brighter future and new contributions to building a community with a shared future for mankind. The confidence stems from a solid foundation. For starters, under the guidance of their political consensus, the SCO members are set to further cement their solidarity and the basis of the organization's future development. Given the rising isolationism and nationalism in some parts of the world, firmer SCO unity has a special global importance. Moreover, the substantial achievements of the Qingdao summit, along with previous agreements, will infuse more vigor into the all-round cooperation among SCO members, and unlock more of the organization's enormous development potential. Offering a glimpse into the future at their latest meeting, SCO leaders have already agreed to initiate or strengthen cooperation in such areas as counternarcotics, tourism, customs, trade facilitation, food security, environmental protection, prevention of epidemics and crime database sharing. Given the Eurasian organization's rising role and increasing influence in the world, an SCO striding toward a brighter future will bring benefits not only to the region but also to the world at large.